Origami tiles are simple flat shapes that can be folded from ordinary photocopy paper and then laid together to create colourful tiling patterns. 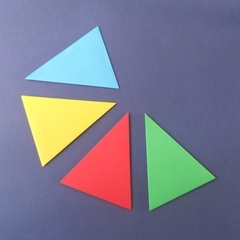 They are ideal for use in the mathematics classroom or at mathematics clubs. If you are unfamiliar with this type of design you might like to begin with the introductory page About Origami Tiles and Tiling Patterns.